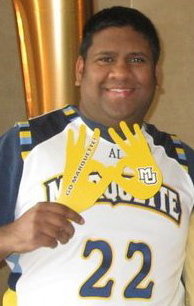 I am a graduate from Marquette University in Milwaukee, WI where I earned my B.A. degree in Communication Studies with a minor in Public Relations. I live and now work in Milwaukee at Potawatomi Bingo Casino where I am the Guest Relations Specialist aka “The Mediator.” My hobbies include: social media, traveling, meeting new people and SPORTS! Since graduating from Marquette I have interned at two places, both in Washington DC. The first internship was with an Advertising company called the Ad Store where my duties included social media (writing blogs), updating the client database, and working with our agency members in creating proposals to potential clients. My other internship was on Capitol Hill for Congresswoman Gwen Moore (D-WI) who represents the city of Milwaukee. While I was working in her DC office, my job included traditional administrative work such as, screening all calls, sorting mail, and copying. In addition, I attended Congressional meetings and briefings where I had to take detailed notes for the Legislative Assistants. I also entered information and comments from constituents into our database. For a year, I have worked at Sport Fair Inc. which specializes in selling swimming equipment (racing suits) to the general public but more importantly club teams, local high school teams, and local universities such as George Washington University and American University. My job included working the floor by restocking items when needed and assisting customers. I also answered all calls to the store and prepared orders for shipping. In addition, I worked the cash register to check-out customers. While working at Sport Fair I had the pleasure to “wine and dine” with Olympic Gold Medalist, Ryan Lochte. Prior to graduating from Marquette, I worked for the YMCA for 7 summers as their Trip Camp Director. I was responsible for organizing, planning, and supervising day trips around the DC area for approximately 50 children a week, aged 5-16 years old. My main duty was to ensure the safety of all the campers and my staff. I also interacted daily with parents by communicating with them and making sure we were all on the same page. I provided weekly schedules for each session to parents and coordinated with my counselors by providing tickets and payments to their proper daily destination. I’ve attended NCAA sporting events at over 20 different campuses. I’ve been to 25 states. Love to Blog and Tweet about Marquette Athletics. I’ve gone skydiving and cliff-jumped. Lettered in 3 Varsity Sports in High School: Rowing, lacrosse, and cross-country. I have dual citizenship with France & United States (fluent in both languages).